Edward and James both must go to Ballahoo. Edward is slow and careful while James is fast and proud. 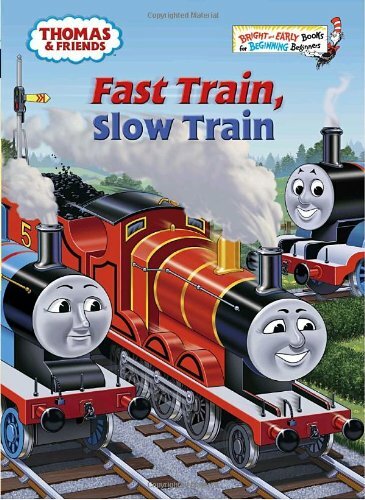 James teases Edward about being such a slowcoach, but Edward is determined to be Really Useful even if he is not fast. A Thomas & Friends version of the classic fable, The Tortoise and the Hare. Perfect for Bright and Early readers! In the early 1940s, a loving father crafted a small blue wooden engine for his son, Christopher. The stories that this father, Reverend W. Awdry, made up to accompany this wonderful toy were first published in 1945. He continued to create new adventures and characters until 1972, when he retired from writing. Reverend Awdry died in 1997 at the age of 85. Tommy Stubbs is an illustrator. His works include The Birthday Express!, A Crack in the Track, and Blue Mountain Mystery.